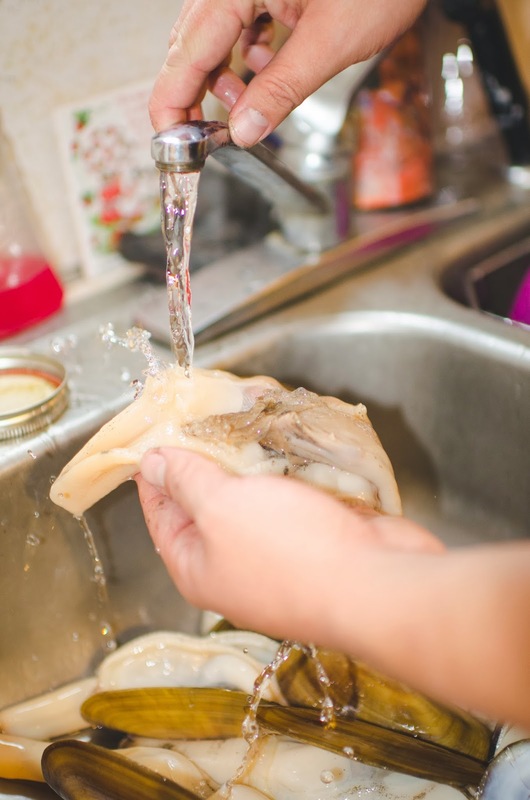 If you are anything like me, you are always looking for new ways to prepare the fish that you bring home. I have a few "go to" recipes that I use regularly, but when I'm bringing home a lot of fish it's nice to have variety. I am a huge advocate for never keeping a fish that you aren't going to either eat yourself, or give away to friends or family that you know will enjoy it. 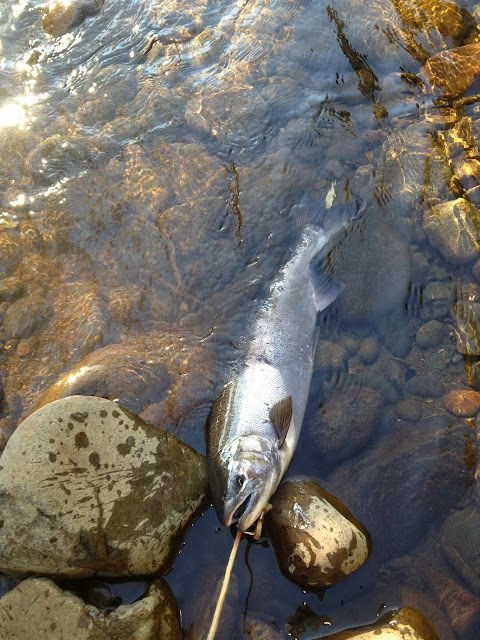 I personally release ALL wild Steelhead, and never take home a fish my family and I won't eat. 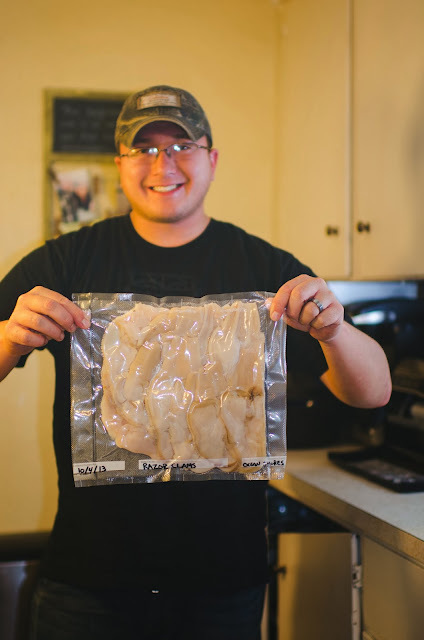 When you do catch a legal fish that you know will get used, by all means take it home and enjoy that freshly caught, organic, healthy GMO free meat that is full of Omega-3 fatty acids. 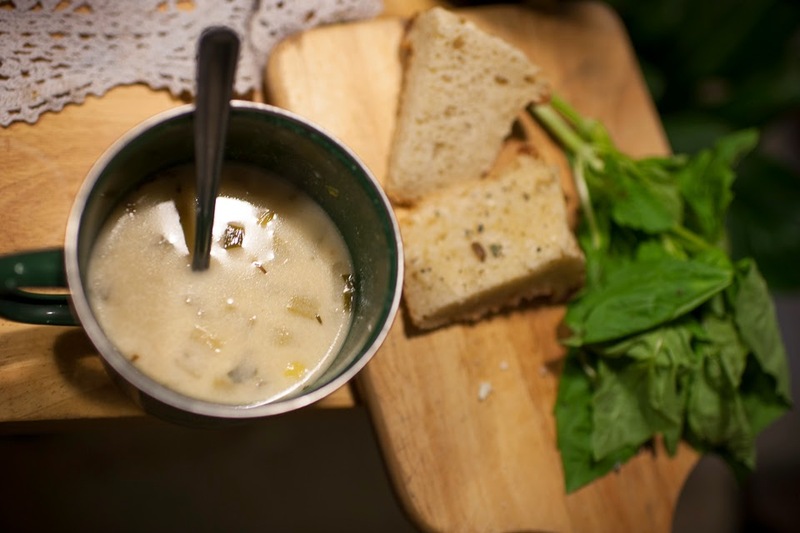 My wife Rikki actually came up with this recipe after I requested she make a chowder with some of the smoked salmon I had in the freezer. I hope you enjoy it because I know we definitely did! This recipe is great because it uses smoked salmon. In my opinion all species of salmon (and trout) can be made to taste good in a smoker. This is important because on odd years here in Washington State we catch a lot of Pinks and then later in the season (every year) we catch a lot of Chum salmon. Although these two species of salmon are not known to be the greatest table fare, they are commonly kept for their eggs, but if you smoke them they can both be made to taste very good. 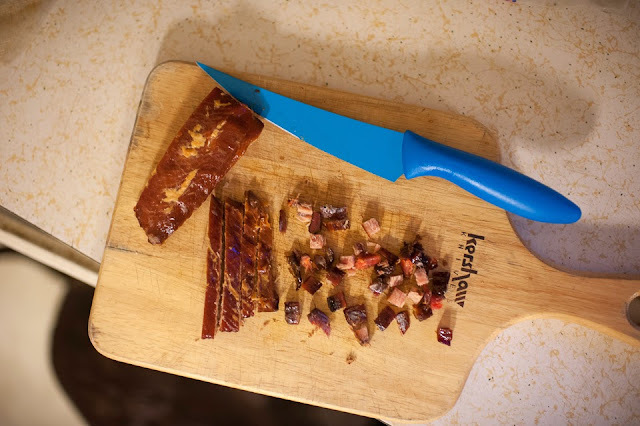 If you don't already have a batch of smoked salmon laying around and you need to smoke up a batch first, I would highly suggest you check out this smoked salmon recipe, especially if you don't already have a favorite brine. 1. In a large pot (we normally use our dutch oven), heat olive oil. Add onion and garlic and sauté until golden. Season with pepper and salt. Pour in heavy cream (any milk will work too) and stir. Slowly add cup of flour and whisk in to thicken, bring to a boil. Whisk again before adding next ingredients to smooth lumps. 2. In a separate pan, bring 6 cups of water to a boil, add bouillon (bouillon to water ratio will not match recommendation on jar). Add potatoes to cream mixture, bring to a light boil. Slowly pour in chicken bouillon mixture. 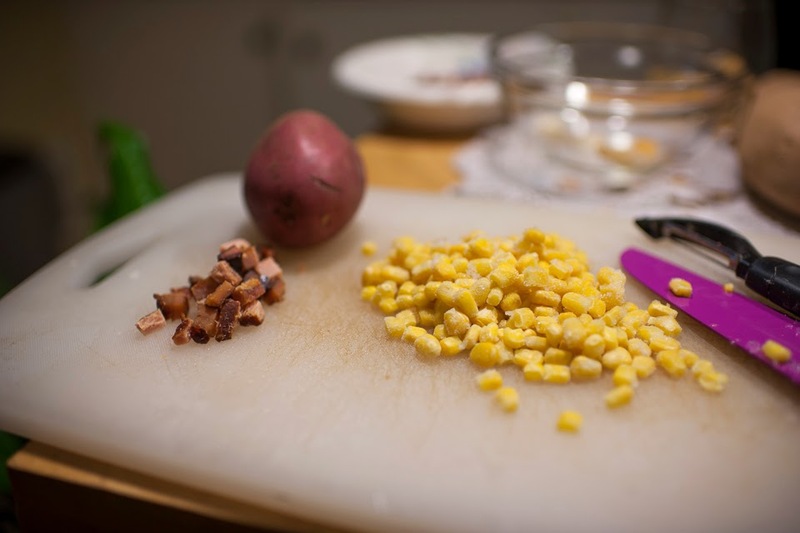 Combine chopped celery, salmon, and corn. 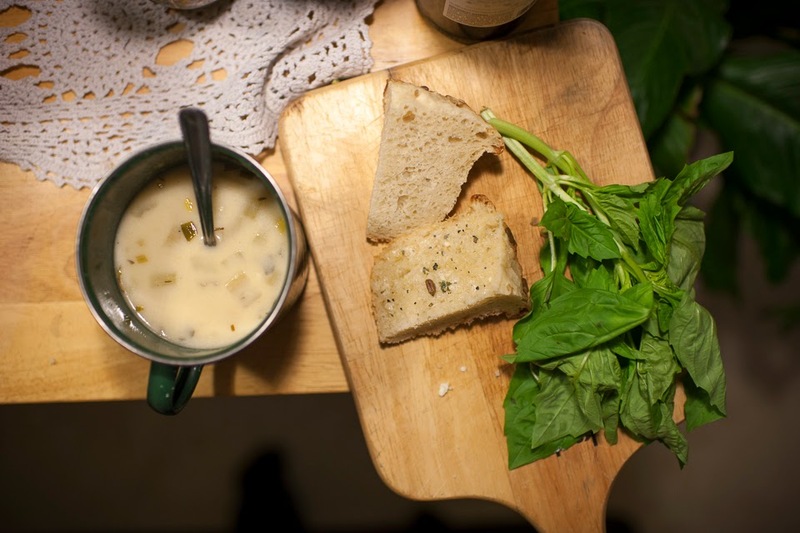 Include minced fresh basil leaves and whole bay leaves. I add the final four cups of water based on the desired consistency, I am for equal parts broth and ingredients mixture. If you don't want so much soup, you can omit these four cups of water and half the potatoes. 3. Once everything has been added to Dutch oven, cover and simmer for 30 minutes. Add salt and pepper to taste. I don't use many seasonings since the smoked salmon is so flavorful. Cover and simmer for 30 more minutes. Garnish with green onions, salt, pepper, and serve hot. "Turn it off! Turn it off! " my wife said as she shook me awake. This is how I commonly wake up during hunting season. You see, my wife is not exactly what we would call a morning person. In fact, I would venture to say that there is no sound that she hates more then the sound of my alarm clocks (yes ,more than one) going off at 4am. Once I am awake she goes back to sleep and I quietly make breakfast and head out the door for whatever adventure that day has in store. On this particular day, I had planned on being in the woods by first light. I had seen some signs of deer in the area I was planning on hunting and I wanted to make sure I was overlooking this clear cut by the time the sun started coming up. I grabbed a can of Monster energy drink to get my blood pumping and headed out the door. I successfully made it to the edge of the clear cut a half hour or so before first light and I quietly got out of the truck, put on my orange vest, loaded my rifle and ever so gently closed the truck door. I then slowly walked up the road, making sure I was down wind from the clear cut, and made my way to a higher point so I could glass the field. That was the end of my excitement...I didn't hear anything, didn't see anything, and definitely didn't shoot anything. I sat there for about 3 hours, then I walked up and down some game trails hoping to jump a buck or at least see some fresh scrapes. NOTHING....didn't see a thing. I continued to hunt the area until I became discouraged, then thought to myself , "Screw it, I'm going fishing," as I headed back to the truck. I was only about 20 minutes from a smaller river that is a tributary of the Columbia and I had fished it in the past a few times and usually did pretty well there. I had planned ahead for this situation and had made sure to take all my fishing gear along with me on this hunt. I drove to the river and put on my waders, grabbed my rods, and then started to wade upriver. This particular river has a reputation for having a lot of snaggers and one thing I have noticed about people that intentionally snag fish is... they are usually pretty lazy. Most of them prefer to fish right alongside the road, or as close to their vehicle as possible. If they don't have to wade or hike anywhere they usually won't. So I hiked a quarter mile or so upriver from everyone else and found a nice seam where the fast water met some slow water and formed a back eddy behind a large boulder. "That's perfect bobber water," I thought as I got my float rod ready and secured some cured roe in the egg loop. I cast my presentation a few feet up from the hole so the river would float my presentation right in to the hole. The water was deeper then I thought so I reeled up and then adjusted my bobber stop so the eggs would be a couple feet deeper in the water on my next cast. I cast again and a few seconds later...BOBBER DOWN. I fought the fish for a few minutes and then reeled in a beautiful chrome bright Coho hen. I continued to fish this spot for a couple hours. I ended up catching three more silvers, two hens, and one bright buck, all of them fishing bobber and eggs. I even had time to go hunt a little bit in the evening as I headed home. I couldn't help but think how awesome it would be to go home with salmon and a deer but unfortunately no such luck. It was still an awesome day and it's always nice to have some fish to take home for the freezer. While I was in Afghanistan last year, I spent a lot of my down time browsing craigslist looking for my first drift boat. I had been on a couple guided trips out of a drifter with guide Larry Ford in Forks, WA and I absolutely fell in love with fishing from a drift boat. The feeling of floating down a river and getting to take in the beauty and scenery that surrounds our treasured Pacific Northwest rivers is just indescribable. The joys of fishing mixed with the excitement of riding through rapids as you travel towards that next hole that has not yet been fished just can't be beat. After my first trip in a drifter I was hooked and I knew I had to have one. I wanted an old beat up drift boat that I could learn on. I didn't want to feel terrible if I (wishful thinking...more like when I) hit rocks, rubbed up on stumps, etc. I liked the idea of aluminum because I've seen the way fiberglass can crack and even though I'm sure fiberglass drift boats can be very tough and durable, the idea of them still kind of makes me nervous. Anyways, after lots of searching, I found an early 80's smoker drifter made by Smoker Craft back in the day when they made drift boats. (Side note: I have not been able to find much history on the Smoker Craft drift boats as far as when they were made, etc. but I know there definitely aren't many out there. If you have any info on the smoker drifters I would love to know the history of them). I sent the owner an e-mail explaining that I was in Afghanistan but was very interested in the boat and that if he was willing I could have my wife Rikki come by and pay for it, and then get a buddy to come pick it up later. The seller was more then cooperative with my situation and even offered to deliver the drift boat to my house for me, and he also offered to give me some rowing lessons when I returned to the States. So I purchased the drift boat sight unseen and anxiously awaited my return home. 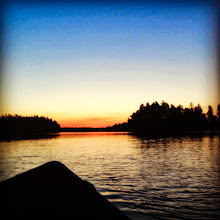 I got home in June and spent quite a few days this summer out on lakes learning how to maneuver the boat. I wanted to get to the point where I could steer the boat without having to think about it first, and I wanted to make sure I was 100% comfortable on the sticks before I ever put the boat in a river. Little did I know that my drift boat would be in every body of water around EXCEPT for a river. I also have a small motor boat that I use for fishing lakes and trolling for salmon on the Puget Sound (a Smoker Craft Alaskan) and I took it out for the first time on 4th of July to do some crabbing. That night the motor was stolen from the boat in front of my house. I was determined to not let the theft of my motor ruin my summer crabbing and saltwater salmon fishing, especially after missing out on the last two seasons being deployed to Iraq in 2011 and Afghanistan from 2012-2013...so I used my drift boat instead. I had that boat in the Puget Sound (MA11 and MA13), the Hood Canal (rowed from Potlatch all the way to Hoodsport hatchery and back in MA12) and rowed all the way around American Lake several times. But I didn't get a chance to drift a river until recently. A few weeks ago I contacted my friend Bryanna Zimmerman from Steelhead Girls and she recommended a good novice float on a pretty well known coastal river. I decided to take her advice that following weekend, so I recruited a couple friends to come along with me on this maiden voyage and spent Friday night preparing leaders, hootchie spinners, twitchin' jigs, plugs, roe, and anything else I could think of that might help us get in to some fish. We left bright and early that morning and made it to the put in a little after first light. We floated about 8 miles and spent the entire day on the river. I mostly focused on maneuvering the boat. I used the oars to slow the boat way down and slowly back our plugs in to the seams when pulling plugs, I tried to keep the boat moving the same speed as our bobbers when bobber doggin', and I practiced rowing up river to make additional passes on promising holes. We threw spinners, twitched jigs, free drifted eggs, and fished every technique we knew. We even ran into Bryanna on the river and she gave us some tips on what plugs to use. We made it to the take out right before the sun went down. Unfortunately, we got skunked that day, but it was a great learning experience for me, and a beautiful day floating the river and fishing new methods for my buddies. Fall is always a very busy time of year for me. 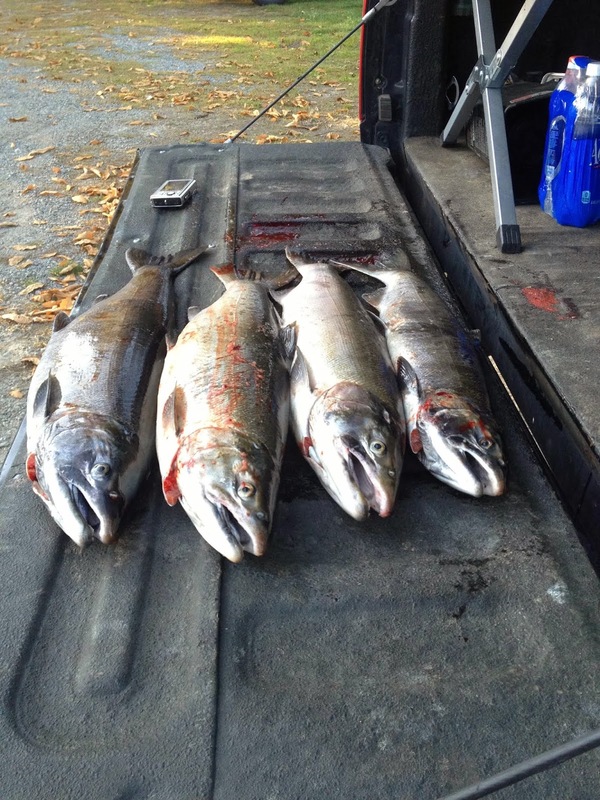 There are Chinook Salmon, Coho Salmon, Chum Salmon, and then Steelhead in the rivers this time of year and all these fish overlap with hunting season! I have to pick and choose what I'm going to focus my time on, and this year I primarily focused on hunting. I did however, get a chance to take the drifter out one more time. A couple weeks ago my buddy Tyler Hoyt contacted me about drifting a coastal river. Tyler is the admin for the Instagram page Fishingbuds. If you haven't already checked out their page, I highly recommend you do. 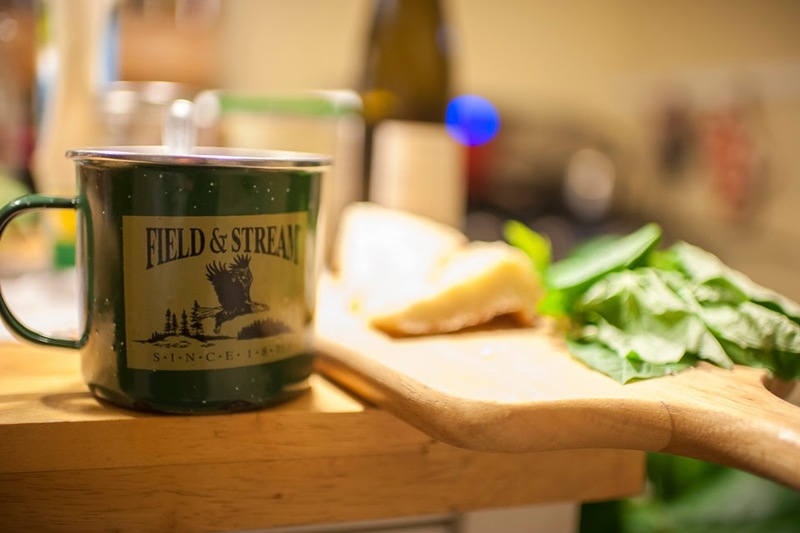 They constantly post hunting and fishing pics from the PNW and whether you are a bass fisherman, a steelheader, or a waterfowl hunter they will have something to offer you. Tyler and I took the drift boat out one day and fished the river hard, it was his first time in a drifter so we focused on some new techniques that aren't commonly used when fishing from the bank. The river was very low and clear at only about 450cfs and we ended up dragging the boat quite a bit. We saw fish rolling and a few fish travelling upriver. There were some silvers and a lot of chum pooled up in holding water, but no matter what we threw at them they just seemed to have lock jaw. The good thing was that we didn't see any other boats catching anything either so that always reassures me that I'm not doing something wrong. Even though the fishing wasn't the greatest we still had a good time learning some new water, trying some new techniques, and just enjoying the beauty of the Pacific Northwest. Not to mention, learning these rivers is helping to prepare me for my favorite fishery...Winter Steelhead!!! I did happen to catch the largest sucker fish I've ever seen in a river, and ironically enough it actually hit a #5 blue fox spinner. I thought it was a jack until I saw it's yellow color under the surface of the water. Not exactly what I had in mind.. .but NOT SKUNKED (um...sort of)! So now you have successfully harvested your limit of razor clams. What next? Well first you need to store them in a way that will keep them alive until you get a chance to clean them. Some people put them on ice, some people will just get a towel or piece of burlap wet with ocean water and place it on top of the clams, some people say keep them in ocean water for a couple hours so they will pump out the sand inside, but I personally just put them in a cooler with the lid cracked open a little to let air circulate and then I clean them as soon as I can. It is always best to clean them the same day you dig, but if for some reason that is not possible just keep them damp with ocean water, and cool, and they will stay alive and fresh for a couple days. Once you are ready to start cleaning the first thing you should do is put them in the sink and rinse them really well with cool water. Make sure to flip them over and rinse both sides so you can get as much sand off as possible. While you are rinsing the clams start to boil some water in a kettle. Once your water comes to a boil you will use it to "blanch" the clams. 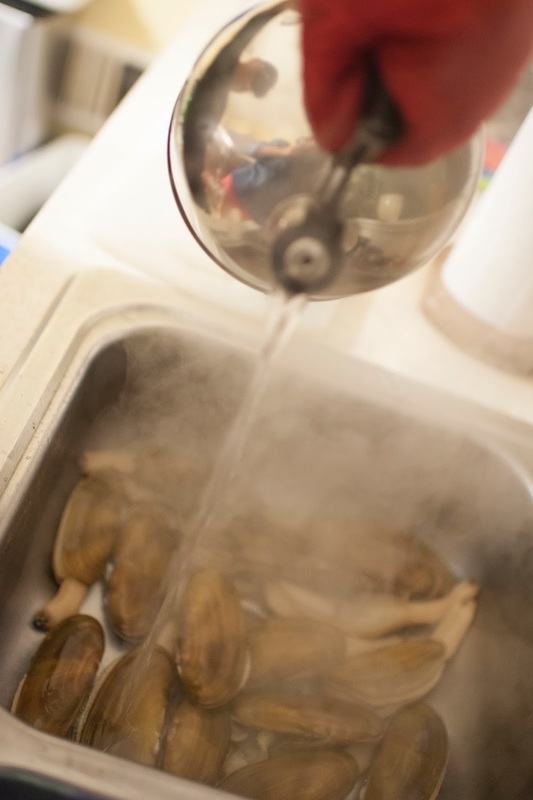 Poor the boiling water over your clams slowly until the clams begin to pop open. This should only take about 10 seconds or so, you do not want to poor the boiling water any longer then that or it will begin to cook the clams causing them to get rubbery and tough in texture. 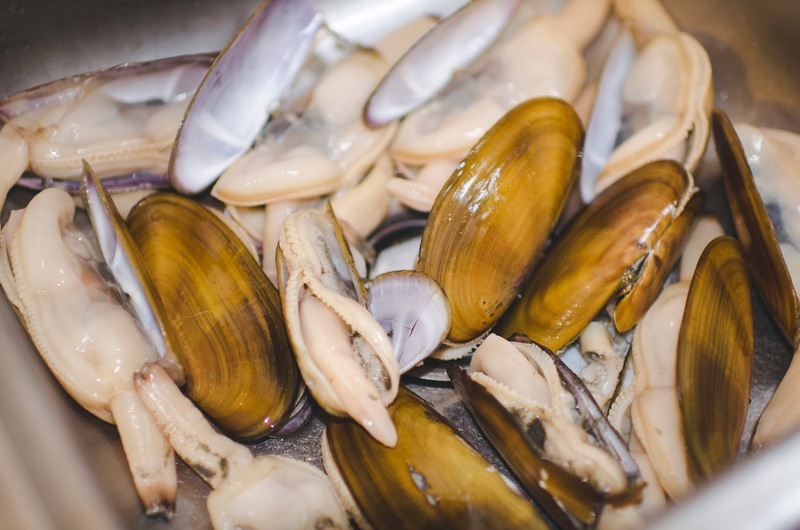 When the clams pop open like in the image above, immediately poor cold water on them and start to remove the meat from the shells. 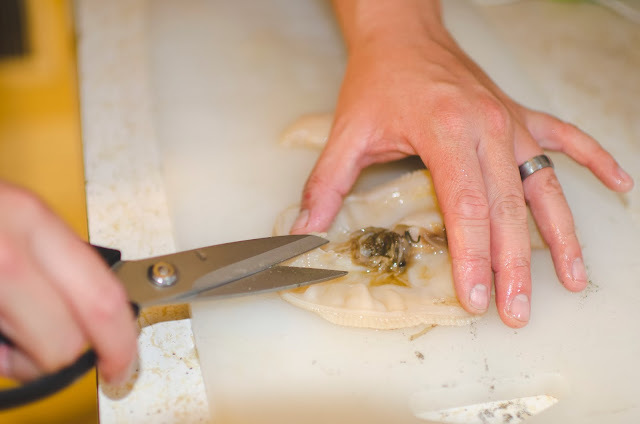 The meat should peel out of the shells very easily by hand. 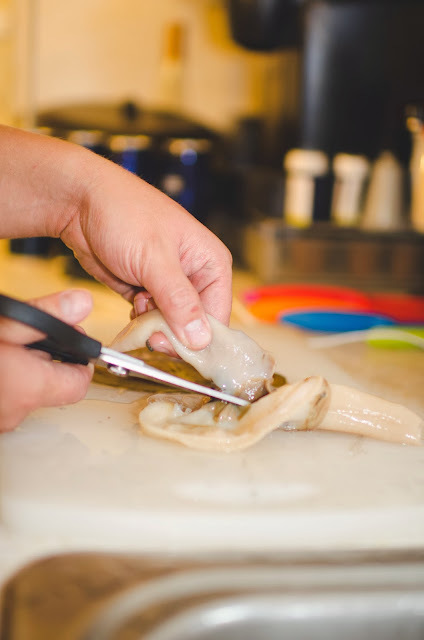 You may need to use a knife to slice through the adductor muscles on some of the stubborn clams. Discard all the shells and set the clams aside as you prepare to clean each one individually. Next, snip the tip of the neck (siphon) off on the clam. A good rule of thumb when cleaning these clams is that anything dark will be discarded, and anything light colored is edible. 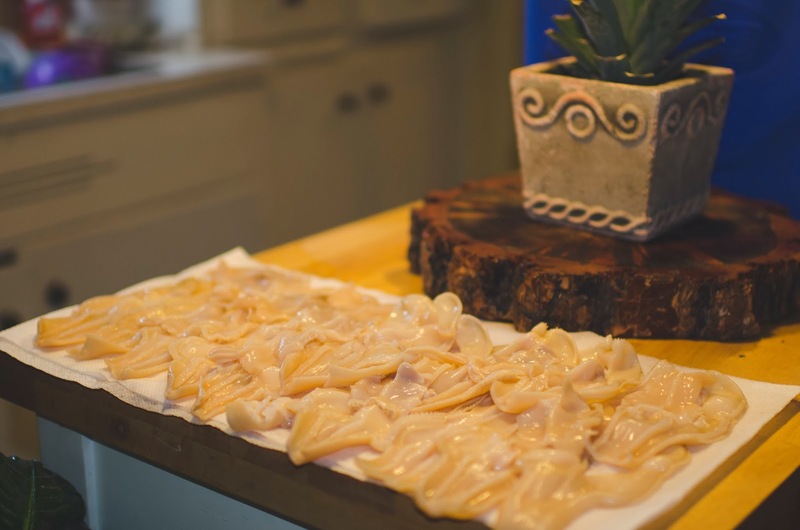 I like to keep the tip of the clam necks to use as bait for surf perch fishing ( just put them all in a mason jar with a little clam nectar and freeze until needed). Never been surf perch fishing? You're missing out! Learn how here. 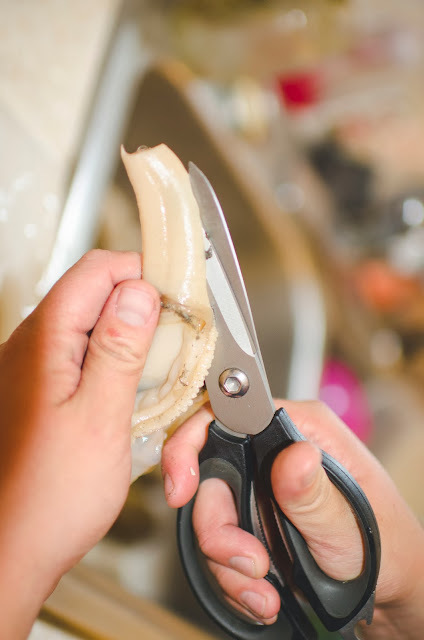 Then cut the clam open from the base of the foot to the tip of the siphon along the "zipper". Rinse the sand out of the meat thoroughly once you have cut the meat open. Cut the digger (foot) off at the base and set it aside. Remove the darker portions (these are gills and palps that make up the mouth) from the meat. Occasionally you will find very small crabs and worms during this process that were consumed by the clam. Just discard them and proceed with cleaning, they do not affect the quality of the meat at all and are nothing to be concerned about. The body of the clam is now done. Set it aside and move back to the digger. Cut the digger down the middle so it will open up and lay flat. Cut away and rinse out all the darker portions so all that remains is the white meat. 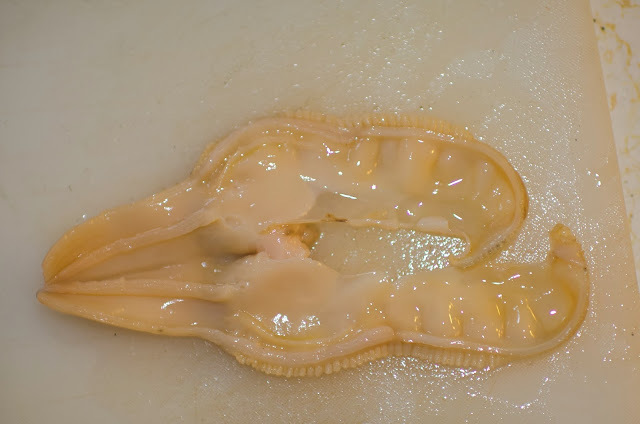 You have now completed the cleaning process on this clam. 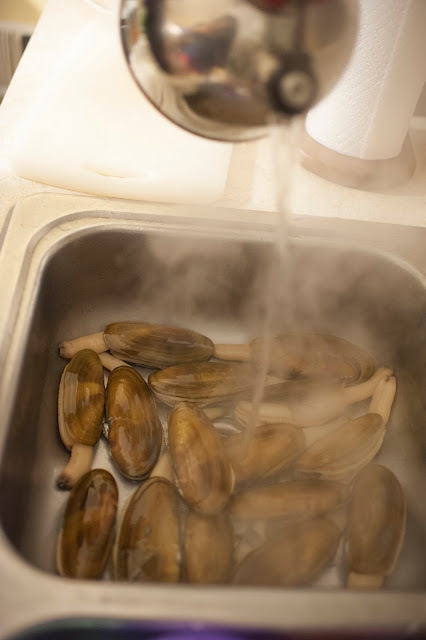 Repeat the entire cleaning process on the rest of your clams. This can be pretty time consuming at first, but like anything else the more experience you have and more frequently you do it the faster and more efficient you will become. I recommend using a vacuum sealer to store your cleaned clams. 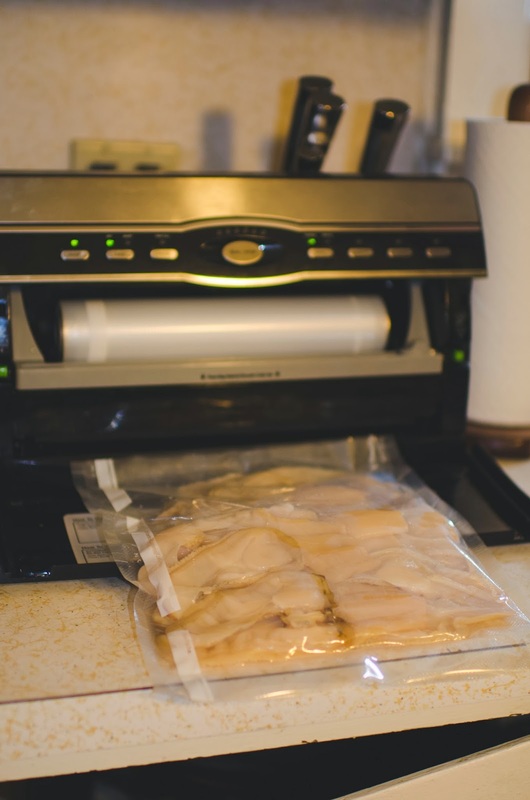 This makes a sealed final product that is ready to freeze until use and also makes a very presentable way to give clams away to your friends, family, neighbors, etc. 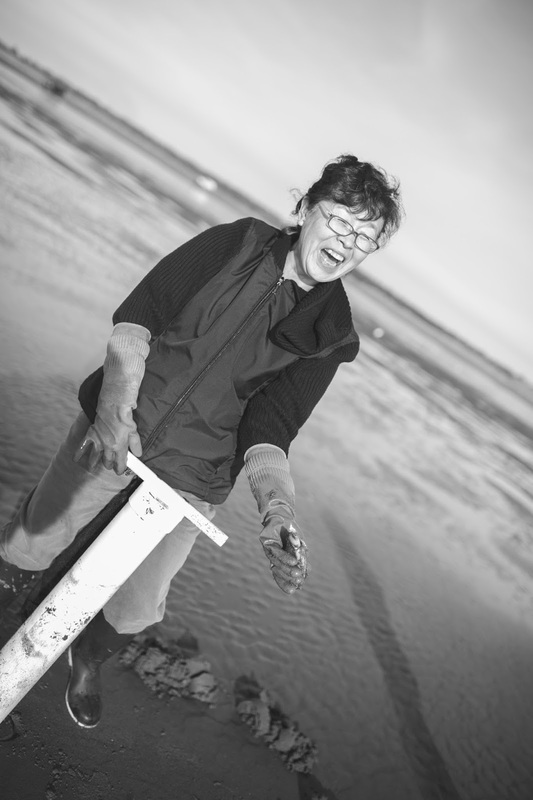 It doesn't take a whole lot of skill to dig razor clams. It's fun for the entire family, in fact, we usually bring our dogs with us too! Razor Clams are delicious! In my opinion they make the best Clam Chowder there is. It is one of the only fisheries where you can generally limit out every time you go. 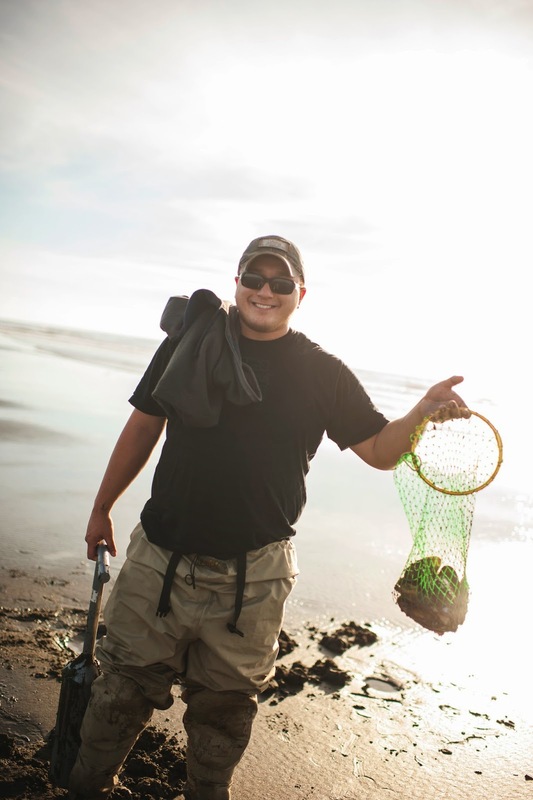 Many of our favorite Salmon and Steelhead rivers are coastal rivers, just minutes from our ocean beaches, which means if there is a clam dig scheduled, you can usually fish in the morning and still have time to make it to the beach for low tide! The beaches are beautiful! Who doesn't need a reason to go to the beach??? 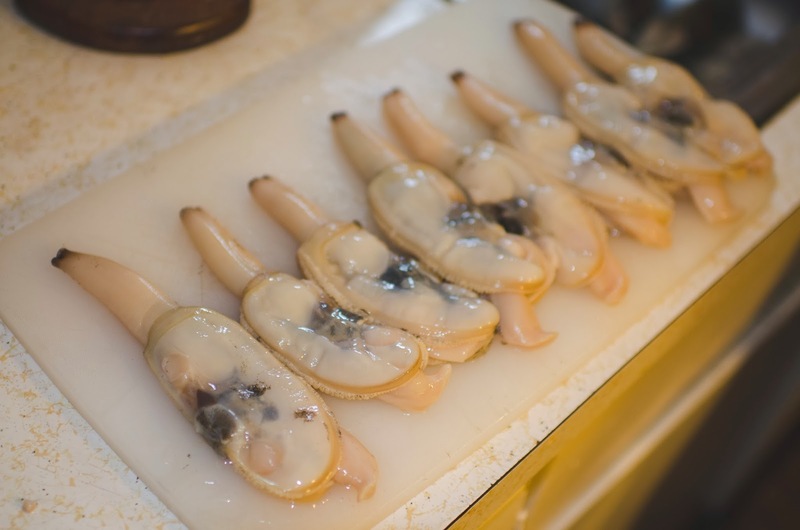 The first thing you need to do is make sure you have the necessary license required to harvest razor clams. Like anything else, you need to make sure you are aware of the rules and regulations before you participate in this fishery. Keep in mind that rules are always changing so it's important to read the fishing regulations every year. DO NOT just assume that the rules are the same as last year. ﻿Once you have the correct license required to dig razor clams, check the WDFW website for scheduled razor clam digs. Make sure to pay attention to which days and what beaches will be open for the dig, since this information can vary from one dig to another. 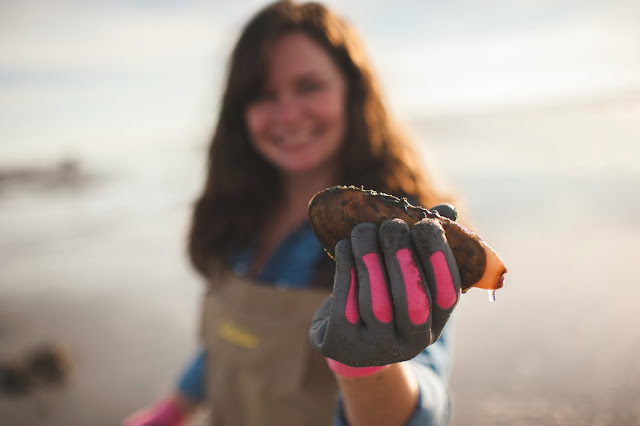 There are many factors that WDFW must consider when scheduling these clam digs, and their primary goal is to make sure clam populations remain strong for years to come through conservation and management, but they generally do a pretty good job of scheduling at least one dig per month during the season (usually October-May). Next, you need to decide what method you would like to use to harvest razor clams. 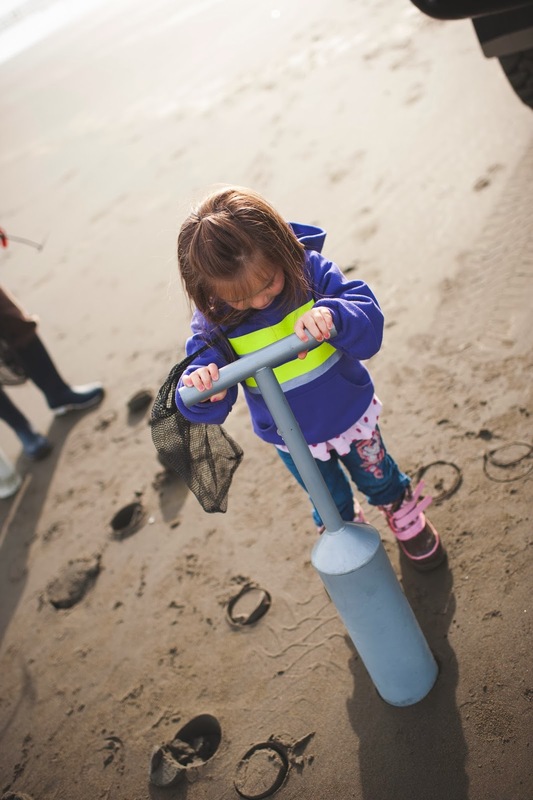 You can legally use your hands, a clam shovel, or a clam tube (commonly referred to as a clam gun) to harvest razor clams in WA. 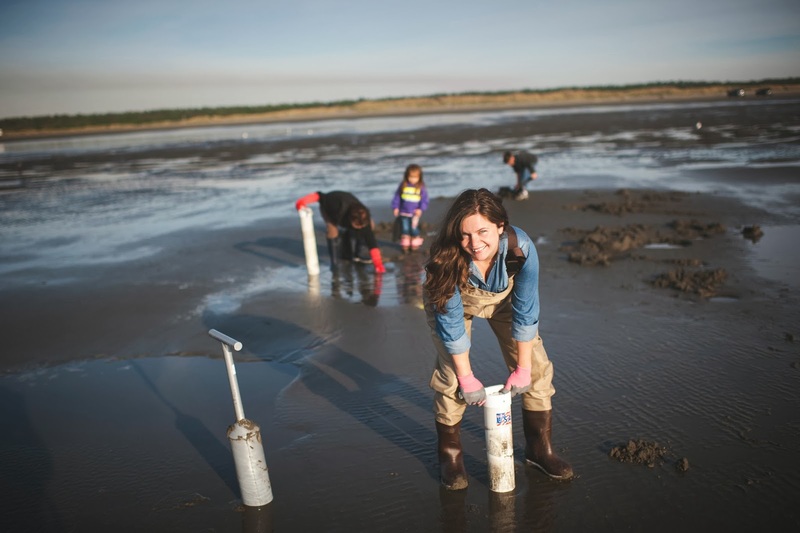 Personally, a clam tube is the best way for a newbie to get started, not only because you can get one for really cheap, but it's also a little easier to learn than a shovel. Another benefit to a tube, you are less likely to get cut by the clams since you usually don't have to actually reach your hand in to the hole. One negative thing about a tube is you are a little more likely to break the clams, especially while you are still learning. Follow these instructions and you'll keep breakage to a minimum. 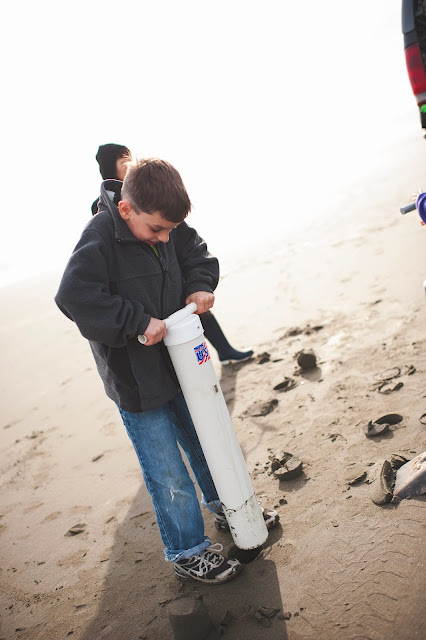 When purchasing a clam tube, you'll notice they are made from PVC, plastic, and aluminum/metal. You will need at least a 4" tube, but I prefer a 5" tube since you are a little less likely to break the shell. The PVC tubes are the cheapest and will certainly get the job done, but they sometimes are not sealed very well and that can cause problems with suction. The plastic and metal tubes work about the same though, of course, the aluminum/metal ones are a bit more durable but are also the most expensive. I would just suggest buying the best you can afford. 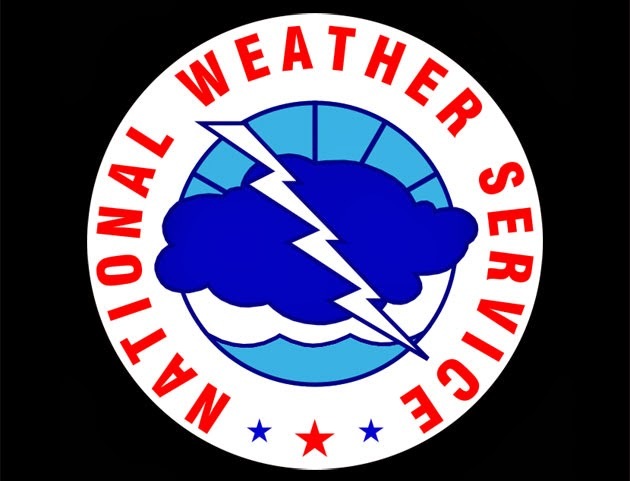 It's not required, but I would also recommend wearing waders or at least rubber boots, some rubber gloves, and bringing along some rain gear to keep you dry. 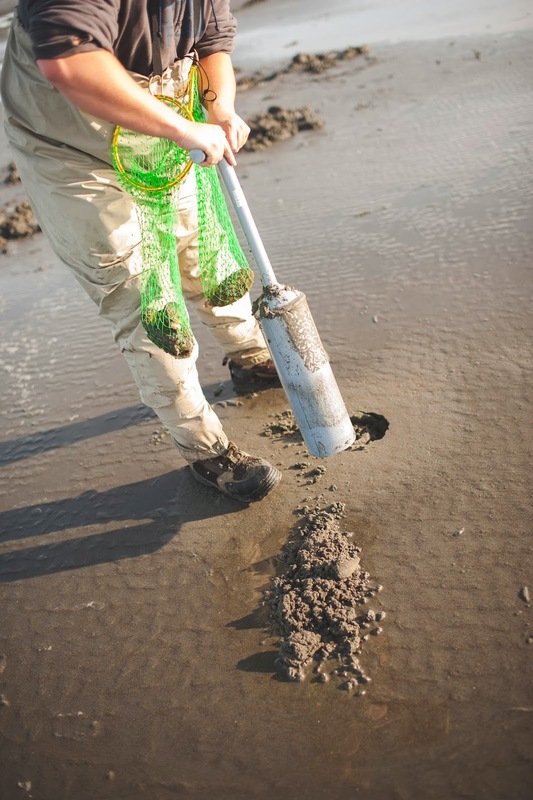 They make special nets for you to put your clams in, but you can make due with a bucket or even a plastic bag if that's all you have, but every digger must have their own container to put their catch in. Find out when low tide will be the day of the dig and arrive at the beach 2 hours prior to low tide. This should give you (and any beginner friends/family) enough time to dig your limit before the tide starts coming back in. Once you are a bit more experienced you can usually get your limit much faster, sometimes in just 20 minutes or so. As you are walking towards the water line, pay attention to the ground as you are walking. You are looking for holes or dimples in the sand, also known as the clam "show". If you see little mounds of sand that look like miniature volcanoes, these ARE NOT razor clams, they are sand shrimp and worms that burrow through the sand and push the sand behind them making these little mounds on the surface... if you see these continue to walk downhill (towards the water) until you see larger holes and dimples in the sand. Sometimes you will see water squirt up, and sometimes you will see the wet sand pulsating under your feet as the clams are digging below you. Once you find a hole, you're in business - where there is one razor clam, there are many (hence the name clam bed). 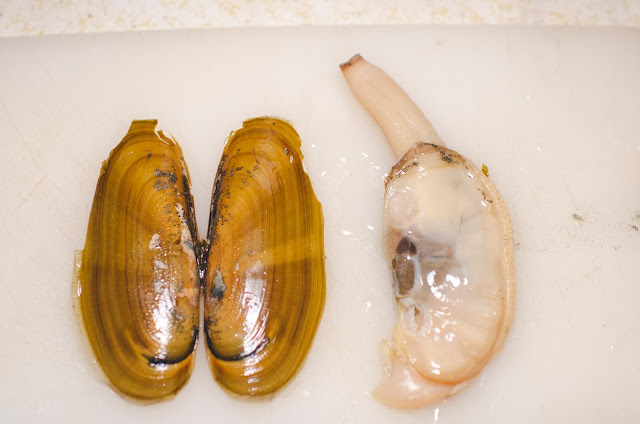 A good rule of thumb when digging razor clams is, the bigger the hole the bigger the clam. I generally only target the holes that are the size of a nickel or larger. A close up of a clam "show"... note the smaller volcano shaped holes that are not clams. 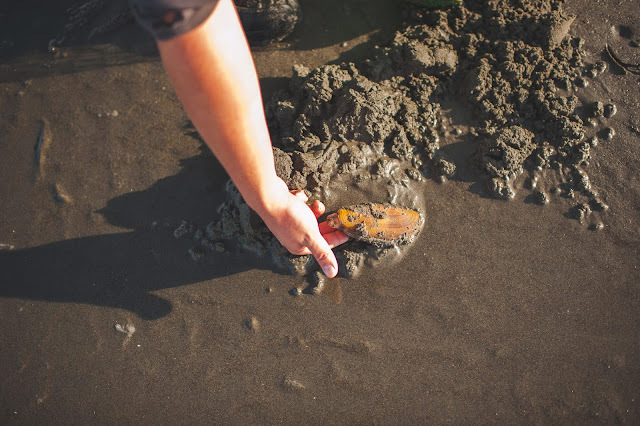 Once you have located a clam hole and have decided you want to try to dig up that clam, take your clam tube and center it on the hole. I recommend keeping the ocean in front of you, and the sand dunes behind you. This way you will be able to see what the water is doing so no waves can sneak up on you. I find that clams usually dig down at a slight angle towards the water, so it is helpful to dig at a very slight angle in that direction (bottom of the tube angled downhill towards the water, handle angled uphill towards the dunes) to prevent breaking or cutting the clams with the tube. Push in to the sand about 8-10". Use a twisting or rocking motion to help cut in to the sand, then put your thumb or finger over the vent hole to create suction and pull the sand up. The sand will come out of the tube in a "core" of sand. If you do not see a clam in the "core" then pull up one or two more cores of sand as needed until you find the clam. If you feel like you have hit something solid, do not keep pushing the tube down! You do not want to break the clam if you can help it. 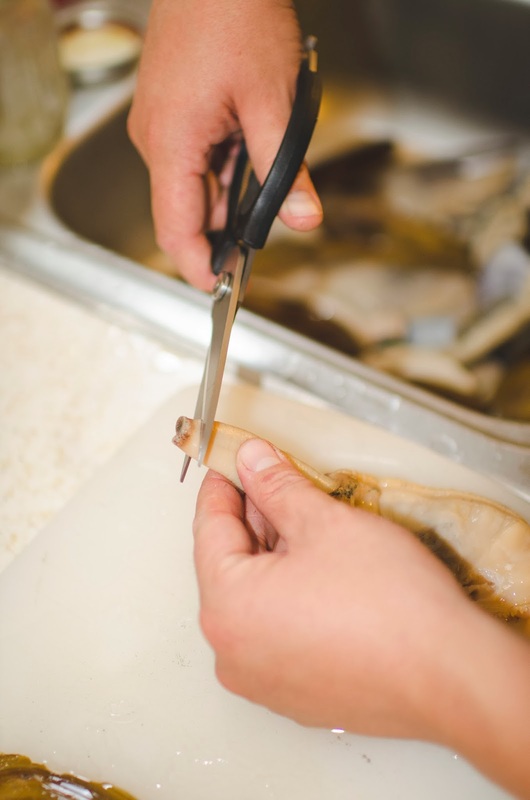 Instead, back the tube up an inch or so and pull up a core, if the clam is not visible, use your hand to see if you can grab the clam, if not, use the tube again and angle it slightly more towards the water. 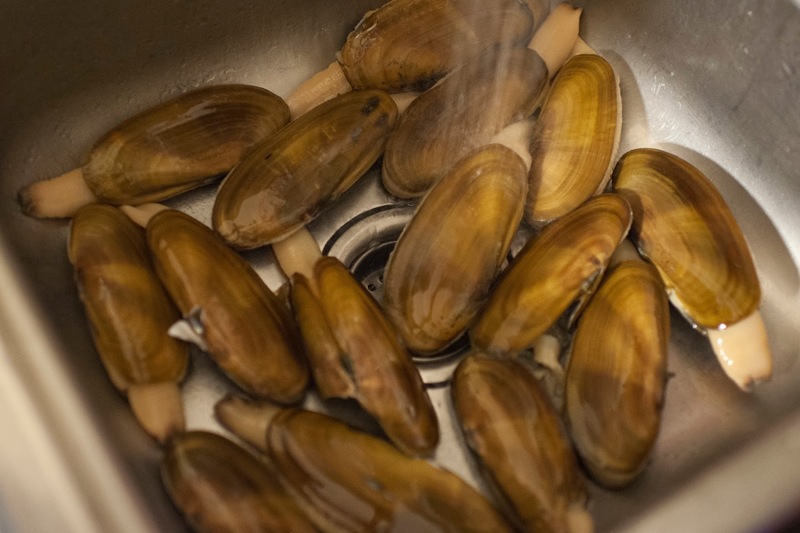 Once you have the clam, rinse it off and put it in your container. Keep in mind all clams that are dug up must be retained regardless of size or condition, no throwing back the ones you break. Successfully repeat this process 14 more times and you have your limit! Center the tube on a hole and then push it in to the sand. Put your finger over the vent hole to create suction and pull up a core of sand. Check each core you pull up until you find the clam. Pulling up a core of wet sand.. Sometimes you have to really dig through the core to find the clam inside. Razor clam digging is fun for the entire family! 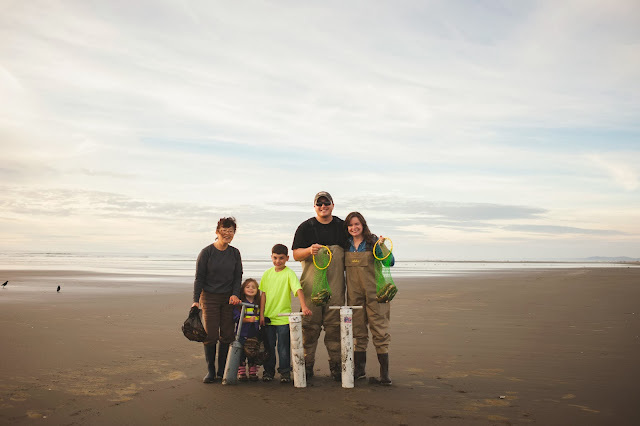 Razor clam digging can be a blast! My mom, daughter, son, myself, and wife all limited out with a total of 75 clams this day.  ©2013 Spartan Fishing | All right reserved. Picture Window theme. Theme images by macroworld. Powered by Blogger.